An old friend is back in the classroom!! HyperStudio is a program that has enabled students to share their ideas, thoughts and creations through a multimedia for many years. 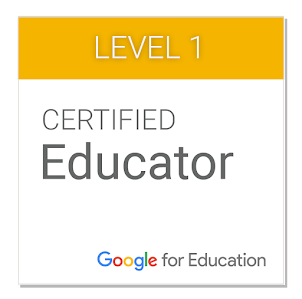 I have had the good fortune to use it with students in my classrooms and share it with educators on 3 continents. Unfortunately, this wonderful program was sold to Learning.com in 1999 which resulted in a series of flawed updates. Eventually, this lead to the program disappearing from the educational scene about 5 years ago. The originator, Roger Wagner, bought back the rights a few years ago and enlisted MacKiev to completely reprogram the product. The new product was announced at the 2007 NECC in Atlanta but it never shipped. MacKiev showed it again at the San Antonio NECC in 2008 and it began shipping earlier this year. HyperStudio is BACK!!! I must admit that I haven't had the opportunity to thoroughly examine the new version, but I liked what I saw at NECC. HyperStudio now has the capability to export to self-contained programs, webpages, podcasts and even iPhones. It is fully integrated to share media with iTunes and iPhoto. The opportunities with version 5.0 are great. Philip Roy gave positive reviews about HS5 in his NZMac blog. 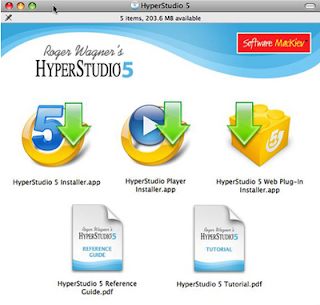 I look forward to working with HyperStudio 5.0 in the future. As a teacher, you DON'T have to be an expert in using technology before you allow your students to use it. This is probably the greatest barrier to integrating new technologies in the classroom. Many teachers believe that they must master technologies before allowing students to use them. Teachers often feel that they must be their students' safety nets in case they fail. This is NOT the case. Teachers should be the instigators of thought and investigation, but they should allow their students to explore ways to express themselves through a plethora of new technologies. This attitude is something that is explained through a slideshow created and displayed by Mike Fisher in the 1 Thing project that Clif Mims is running over at his blog, Clif's Notes. You might notice that Mike Fisher created this slideshow using MyPlick. This is a site where you can upload your slides, synch them with your voice and then share them with friends. 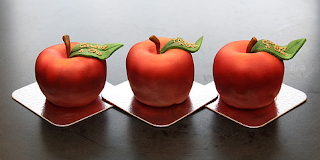 It is REALLY easy to share them with friends. I just use their embed feature to transfer this file over to this blog posting - no muss, no fuss. You will probably see me begin to use this in the future. It is Tres Cool!! The folks at Inspiration have developed an on-line version of their prize-winning software gem and named it Webspiration. Thinkers, large and small, have huddled around computers for almost two decades using Inspiration to help them organize and develop their ideas. They have worked alone and in groups but the limitation has always been that they could only diagram their ideas on a single computer at a time. Webspiration elevates Inspiration to the level of online collaborative work tool. Students create an account and then can create diagrams/outlines that are saved on the Inspiration server. Having these maps online makes them accessible from any computer. This is handy for students who want to work on their diagrams at school, home and ?? Collaborative? Yes, the creator of a diagram can share it with collaborators by sending invites to friends who have Webspiration accounts. Collaborators can sign onto Webspiration and work on common diagrams whenever they are interested. Multiple collaborators can also be online simultaneously and work together on the diagram. The only limitation is that the they can't work on the file at the same time. As the video shows, one person works as the editor and the other collaborators are spectators until the active editor passes control over to the next person in line. This makes it less collaborative than Google Docs that allows multiple collaborators to work in a document simultaneously. Is this a problem? It can be. I found that some of my students were OK with waiting in line but others became quite frustrated when they had to "holster" their creativity until it was their time to emote. Watch this short Jing video that I created to demonstrate Webspiration in my ISTE Webinar. Give it a try. Go to http://www.mywebspiration.com and try out the Inspiration of Tomorrow. For more information, visit the MyWebspiration site. I just found a moving video through Facebook. It is entitled “The girl who silenced the world for 5 minutes.” This video depicts a 13-year old girl, Severn Suzuki. who addressed the United Nations Conference on Environment and Development in Rio de Janeiro in 1992. She and four other children in their organization, Environmental Children’s Organization traveled from Vancouver to Brazil to tell the adults at the conference that they must stop destroying the world. There is no way that I can explain the emotional impact that this can have on you, so you should watch this yourself. I don’t know what difference this girl’s speech had on the UN conference attendees but it is a fine example of a self-motivated person working to impact the world. I love the opportunities that the new mini-laptops (also known as netbooks) have provided for learners and users. This idea began with the OLPC (One Laptop Per Child) which originated with Nicholas Negroponte at MIT. He was the advocate who went to vendors with a vision of a minicomputer that ultimately weighed only 3.2 pounds. I bought one of the first XO computers and am constantly amazed at its capabilities. Asus was also a pioneer in this field with their Eee PC (Wikipedia says Eee comes from "Easy to Learn, Easy to work, Easy to play.") They say that they now have an all-day netcomputer with a battery that lasts 6-7.8 hours. The missing player has been Apple. Why hasn't Apple thrown its hat into the netbook ring so that we can edit our videos using iMovie '08 (ouch) on a 2.2 pound OS gem? Well, I DON'T KNOW. I would guess that Apple is having a problem with the idea of creating a computer that costs less than $500. While I am an Apple evangelist (not at the Guy Kawasaki level but I luv my Mac), Macintosh computers are typically priced higher than their competitors. Personally, I think that these computers are worth paying a few extra sheckles to own a Mac but $500 may be too low for Apple to get its typical profit margin. Never fear!!! I just found some resources on the web that can help you find eternal satisfaction by having a Mac OS netbook under your arm. These resources include a rumor about Apple releasing a netbook at the MacWorld 2009 and, for those of you who can't wait until January to see/have a Mac netbook, I have found a site that tells you how to load the Leopard OS onto a netbook. Rumor has it that Apple will be announcing a Mac netbook at MacWorld 2009. While it appears that Steve Jobs is not going to be doing his typical new product introduction at MacWorld, InformationWeek is reporting that pundents are predicting a Mac netbook that will probably run about $599. Technically this doesn't place them in the true netbook (< $500) genre, but it Apple has never been a company that cares about labels. It is also predicted that Apple will justify the additional $100 expense by offering "an array of content, applications, and games through the App Store, which is accessible through the company's iTunes software." Information Week predicts that this will be released mid-year 2009. Hadley Stern of Apple Matters provides "5 Reasons Why An Apple Netbook will be Released at MacWorld." Hadley says that these reasons include 1) The economy, 2) Chips, 3) The iPhone, 4) Jobs gets to say he invented it, and 5) Extend iTunes reach. It is a lot of logical ideas that are based upon Apple's history. These ideas are fun to read and I think that they can support InformationWeek's predictions. If you can't wait until July to have a Mac netbook, Wired magazine's site has a video by Brian X. Chen entitled Running OS X on a Netbook. This video shows you how you can make a couple of small chip changes on an MSI Wind Netbook and then load Mac OS X onto the computer (Note: this is a hacked version of Mac OS X which is illegal so I am just sharing this with you as an exercise in exploration.) How well does this run the Mac programs? I don't know, but wouldn't it totally freak our your friends if you opened your MSI netbook to reveal Mac OS X? It allows me to write my own script (text-to-speech) or I can use their pre-recorded pieces. The only problem is that the computer voices that red the text are pretty bad. It would be great if they allowed us to upload our own voice files. 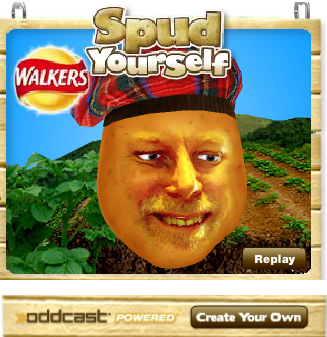 Spud Yourself - It will be fun! I just found a 10-minute video on Epic FU on how to make a K-A Web Show. Epic FU identifies themselves as the Zadi Diaz runs through a epic list list of resources that you can use to create your own video shows. Fortunately they have a list of the scores of resources that Zadi introduces. 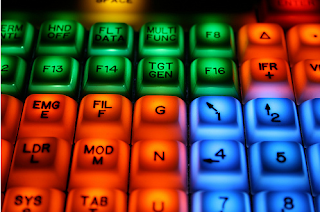 Epic FU uses the Epic FU blog to support each of their broadcasts with additional resources. While this video appears to be designed for Web-based video producers (be they professionals or teenagers), this could be an Awesome resource for educators who want to integrate video into their learning environments. They referred me to a place that I hadn’t seen before – wikiversity. This is a place I had never visited but it appears to be where you can learn about a myriad of topics for free. It is run by the Wikimedia Foundation that is the same group that runs Wikipedia. They specifically linked us to the Filmmaking page which they describe as “a preparatory school for budding filmmakers who plan to go to film school or take classes in motion picture production.” I haven’t tried wikiversity before. What are your experiences? Personal Note: This is funny, I feel a difference in the voice that I am using when I discuss using video in education versus using it in the “Real World.” Why is this? Is it because of the “anything goes” feeling of a production like Epic FU. When we are working with students we have to worry about propriety. Epic FU says "popular culture -- it's about conversation and interaction." Is that our problem? That's funny. Good teaching/learning is about conversation and interaction too. Are we doing that enough? I don’t know about this. What are your opinions? Last summer I wrote a white paper for Sunburst Technologies, A New Look @ Research-Based Keyboarding Instruction, which was a review of the existing research in teaching keyboarding. I want to share this document with you because I believe that it is an important overview of what has been found out about best practice in teaching keyboarding and addressing the needs of students in their pursuit towards becoming efficient and effective keyboarders. Admittedly, this document was sponsored by Sunburst Technologies but that doesn’t reduce the importance of the research synthesis provided here. If you have further interest in Teaching Keyboarding and the research behind it, visit my blog - KeyboardingResearch.org It is filled with references that you might find useful when you are trying to answer questions about keyboarding or need research to support what you are trying to do in your classroom.